To meet huge market demands, we are involved in presenting best quality of Fixed Core Egg Crate Grilles. 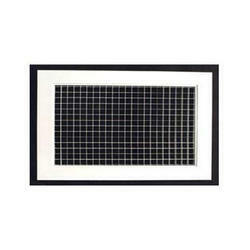 These Fixed Core Egg Crate Grilles are frequently used either as supply or return grilles and are available in fixed and in many other suitable applications. Further, these products are highly durable in nature. Egg Crate Grille Egg Crate Grille is one of the many exhaust application devices available which offers 1)0th Engineering and Architectural requirements. Features: 12.5mm lattice style high free area core in either fixed or removable core versions. Fixing: sidewall,soffit or ceiling mounting and is normally used for extract applications. 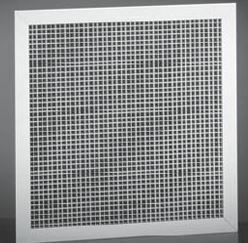 : The Egg Crate Grilles as the name suggests have a high net free area, made out of high grade extruded aluminum are ideally suited for collecting return air in HVAC applications. Made of Extruded Aluminum Frame and Aluminum Eggcrate 12.5mm x 12.5mm x 12.5 mm.